Are U.S. Tobacco Companies a Good Investment? Tobacco is an addictive substance that's hard to quit. Does that make tobacco producers a good portfolio holding? 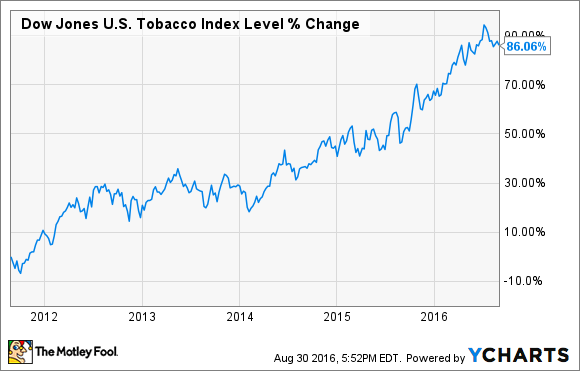 With their profits continuing to build over the past few years, U.S. tobacco companies have seen their stocks move higher. However, second-quarter earnings results showed declines in revenue as cigarette shipments in the U.S. fell, a developing trend as of late. Is Big Tobacco as sure of a bet as some investors think? In the past five years, U.S. tobacco stocks as measured by the Dow Jones U.S. Tobacco Index have nearly doubled in price. Profits have been on the rise. But that only tells part of the story. Despite the increase in valuation, tobacco use has been falling in the United States. Cigarettes, representing the biggest category of tobacco products, have been steadily in decline. In the past decade alone, the percentage of Americans who smoke has fallen from 21% to 16%. Half a century ago, the percentage of smokers in the U.S. was north of 40%. The trend could continue, as a survey in 2011 by the Center for Disease Control showed that seven in 10 smokers wanted to quit. This trend showed up in the last earnings report for tobacco companies in the United States. Marlboro cigarette maker Altria Group (NYSE:MO) had total revenues decline 1.4% year over year, as revenue from smokable products, consisting predominantly of cigarette sales, fell 2.4%. Total volume of shipments fell 4.9%. The news was similar at Altria's rival Reynolds American (NYSE:RAI). While revenue and shipments were up year over year because of last June's purchase of the Newport brand, the company reported that shipments of cigarettes industrywide declined 3.9%. The company's Camel and Pall Mall brands both felt the hit, with volumes going down 2.8% and 5.4%, respectively. With the biggest source of sales for tobacco producers in decline, does that mean it's game over for these companies? Even though cigarette shipments are falling, tobacco companies have still been able to squeeze out increases for the bottom line. Altria, for example, has used price increases, cost cutting, and alternative revenue sources to help offset the fall in the core business. Smokable products declined last quarter for Altria, but the loss in revenue was partially offset with price increases. As mentioned, revenue from smokable products fell 2.4% versus a 4.9% decline in shipments, with revenue falling less than sales because of the price increases. Cost cutting has also helped. Altria announced a productivity initiative in January, and the efforts to get lean are under way. During the quarter, selling costs fell 4%, and marketing, administration, and research costs fell 13.7% year over year. Finally, investments outside tobacco are also helping Altria's profitability. Though they make up a small percentage of the overall business at only 10.6% of revenue, chewing tobacco and wine notched year-over-year gains of 8.7% and 6.2%, respectively. The company also reports owning about half of the e-cig market in the U.S., with its Nu Mark brand, but the numbers are not broken out specifically. In addition to the wholly owned chewing tobacco, wine, and e-cig businesses, Altria also owns a 27% stake in global beer maker SABMiller. The company logged $199 million in earnings last quarter from that investment and stands to make $3 billion pre-tax if the proposed merger of SABMiller and Budweiser maker AB InBev (NYSE:BUD) goes through. Price increases, cost cutting, and alternative revenue sources in total helped Altria notch a 14.2% gain in profits last quarter. While not exactly the same recipe, a similar strategy has also helped Reynolds American boost the bottom line so far this year. The future of big tobacco in the U.S. The future for some of these companies may be that tobacco is not as big a player in business as it is now. With cigarette use continuing to decline, finding other ways to generate business will become increasingly important for tobacco companies going forward. Price increases and cost cutting can only carry profit growth so far. After all, even an addictive substance like tobacco can suffer loss of users because of higher prices. Most people who quit smoking cite health reasons, but the second most mentioned reason was the increasing expense involved. Altria has taken note of the trend and has laid out a template for how other tobacco companies can offset losses from tobacco with growth in other segments. Investors in tobacco companies should be looking for progress in new business ventures to justify the holding. But are tobacco companies a good investment? It is remarkable that big tobacco has been able to grow profitability amid a backdrop of declining consumer interest. However, I would be deeply worried as an investor if a company I owned was experiencing long-term losses in the core business. Even putting aside moral considerations, I don't think U.S. tobacco is a good investment.